Some folks have an inner child, some have an inner pirate. 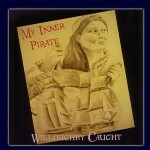 And despite her album’s title of “My Inner Pirate,” I strongly suspect Willoughby Caught actually has both – the only question is which one drinks the rum and which one gets to hold the musket. My Inner Pirate features a variety of traditional, original, and quasi-original pirate tunes, mostly sung in a fun, light-hearted manner. Some, such as Calico Jack and Salmagundi, come across as pirate-acceptable kid’s song, while Drink Like a Pirate takes on a more adult theme in both content and tone. Most of the songs, however, manage to walk the fence between these two extremes in a manner that’s both kid-friendly as well as piratey. While some of the album’s tracks do appear to be genuinely original, far more are piratey adaptations of traditional songs. Blackbeard’s Final Battle is a variation on Blow the Man Down, The Pyrate’s Way a variation on Pay Me, You Owe Me, and both Pyrate Pete’s Rum AND The Ballad of Grace O’Malley are variations on Wild Rover. While this sort of partially original music to me generally falls flat (I much prefer a fully original composition) the results are still quite decent (although having two tracks with the same origins on the same album does feel a bit repetative. All told, My Inner Pirate is a decent album of relatively gentle pirate music. It offers a very traditional variety of folk songs altered just enough to set it apart as a bit more piratey than the fully traditional versions often performed by other shanty artists. This entry was posted in Music and tagged willoughby caught by Bilgemunky. Bookmark the permalink.